THANK YOU TO EVERYONE WHO SUPPORTED US! 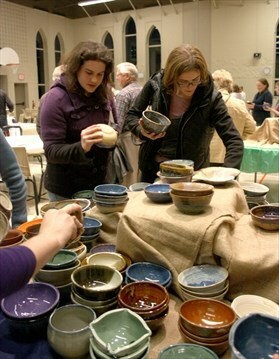 Please support all those who helped make Empty Bowls a success! ​Every year in October, Dundee Pottery works with other local businesses and organizations to host a fundraising dinner for Haiti. When you buy a ticket to Empty Bowls, you get an evening of community and entertainment, a delicious soup, a handmade pottery bowl - and an opportunity to support sustainable growth and change in Haiti. 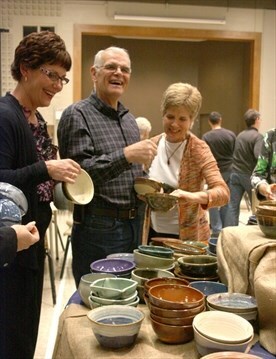 Funds raised by Empty Bowls will be used to support MCC's tree planting efforts in Haiti. MCC (Mennonite Central Committe) has had a presence in Hiati since 1958, they strive to work with local groups and communities to meet the goals identified in that community. Please visit their website for more information about their initiatives and community partnerships. ​I had an opportunity to visit Haiti a few times while visiting family. Those visits changed how I see my daily life. Stepping into the shower reminds me the only access to water is a river where everyone goes to bath. Turning on the wash machine reminds me of that same river where the women do the laundry. Having a drink of water again reminds me of that same river from where the water for cooking and drinking is carried home, sometimes miles away on the heads of family members. When I go to bed at night I remember the small stone huts, galvanized roofs, dirt floors, mats and the heat, where families sleep.When I cook a meal I think of the small charcoal fires burning in the yard to prepare what might be the one family meal. Simply put there is need in Haiti, I saw it, it impacted me. While I don't have a complete understanding of the complexities of the problems in Haiti or the working of governments I do understand that we are called to love. I have a part. Not changing governments, but I can make bowls. Not studying policy but researching which NGO provides good service and stewards our money well. I trust MCC. My challenge to you is, not necessarily purchasing a bowl or coming to the event (although I would love it if you came), but be impacted by someone and love.